It was in 2011 that Saheb Biwi Aur Gangster, a contemporary spin on Abrar Alvi's Sahib Bibi Aur Ghulam, pleasantly surprised critics and the audience. 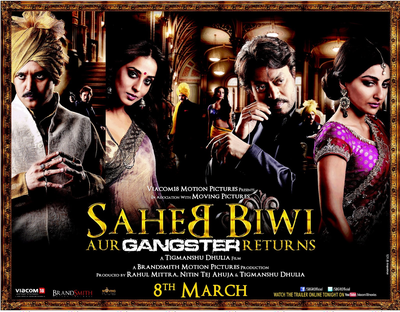 Saheb, Biwi Aur Gangster Returns’ is more “opulent and intriguing” than its prequel and he has lived up to his claim. Dhulia weaves a complex tale of love, jealousy and revenge and the taut narrative ensures that it keeps the viewer engaged throughout. Saheb Biwi aur Gangster Returns doesn’t fully deliver the juicy thrill of the first film. But it should be seen for its characters and dialogue. These thoroughly nasty people are worth spending time with. A royal saheb grapples with disability and betrayal his estranged biwi dabbles with daaru and political demons. The gangster wages a war for pride and honour. As for the film as a whole, there can be no room for any doubt. It is recommended unequivocally. Saheb Biwi Aur Gangtser Returns is not an attempt to milk the success out of the first intallment but to tell a new story in a new way. Saheb Biwi Aur Gangster Returns is tragic yet a lot of fun to watch. It is bizarre but with a distinct method in its madness. And it ends with the promise of another sequel. I say bring it on! A little more screen presence would have helped. Inderjeet Singh (Irrfan Khan) is a gangster that is having a love affair with Ranjana (Soha Ali Khan) and wishes to teach Saheb a lesson. Charmed to captured again.. ViaCom 18 and Tigmanshu Dhulia return with Saheb, Biwi Aur Gangster comes with added characters and is a seductively thrilling absorbing wicked fun. His directorial venture 'Saheb Biwi And Gangster Returns' is another exemplary film of the same style and ritziness. Tigmanshu Dhulia's sequel Saheb Biwi Aur Gangster Returns isn't as impressive as his first offering but still deserves a definite watch for the impeccable writing and performances. A hard-hitting tale about star-crossed lovers, laced with dark humour and wit! This sequel has lot to appreciate in terms of performances but at the same time it lacks the product Tigmanshu Dhulia used to be known for.